Oil spills kill fish. That’s well known. Now scientists say they have found out why oil spills kill adult fish. The chemicals in the oil often trigger an irregular heartbeat and cardiac arrest. A joint study by Stanford University and the US National Atmospheric and Oceanic Administration have discovered that crude oil interferes with fish heart cells. The toxic consequence is a slowed heart rate, reduced cardiac contractility and irregular heartbeats that can lead to cardiac arrest and sudden cardiac death. The study was published Feb. 14, 2014 in the prestigious international journal Science and unveiled at the convention of the American Association for the Advancement of Science in Chicago. The study is part of the ongoing Natural Resource Damage Assessment of the April 2010 Deepwater Horizon oil spill in the Gulf of Mexico. Scientists have known for some time that crude oil is known to be “cardiotoxic” to developing fish. Until now, the mechanisms underlying the harmful effects were unclear. Studies going back to the Exxon Valdez oil spill in Alaska in 1989 have shown that exposure to crude oil-derived chemicals disrupt cardiac function and impairs development in larval fishes. The studies have described a syndrome of embryonic heart failure, bradycardia (slow heart beat), arrhythmias (irregular heartbeats) and edema in exposed fish embryos. After the Gulf of Mexico spill, studies began on young fish in the aftermath of the Deepwater Horizon spill. The two science teams wanted to find out how oil specifically impacts heart cells. Crude oil is a complex mixture of chemicals, some of which are known to be toxic to marine animals. Past research focused on “polycyclic aromatic hydrocarbons” (PAHs), which can also be found in coal tar, creosote, air pollution and stormwater runoff from land. In the aftermath of an oil spill, the studies show PAHs can persist for many years in marine habitats and cause a variety of adverse environmental effects. The scientists found that oil interferes with cardiac cell excitability, contraction and relaxation – vital processes for normal beat-to-beat contraction and pacing of the heart. The study shows that very low concentrations of crude oil disrupt the specialized ion channel pores – where molecules flow in and out of the heart cells – that control heart rate and contraction in the cardiac muscle cell. This cyclical signalling pathway in cells throughout the heart is what propels blood out of the pump on every beat. The protein components of the signalling pathway are highly conserved in the hearts of most animals, including humans. The new study also calls attention to a previously under appreciated risk to wildlife and humans, particularly from exposure to cardioactive PAHs that can also exist when there are high levels of air pollution. The study used captive populations of bluefin and yellowfin tuna at the Tuna Research and Conservation Center, a collaborative facility operated by Stanford and the Monterey Bay Aquarium. That meant the research team was able to directly observe the effects of crude oil samples collected from the Gulf of Mexico on living fish heart cells. 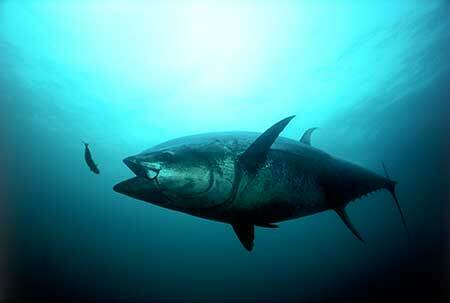 The spill occurred in the major spawning ground of the western Atlantic population of bluefin tuna in the Gulf of Mexico. The most recent stock assessment, conducted in 2012, estimated the spawning population of the bluefin tuna to be at only 36 percent of the 1970 baseline population. Additionally, many other pelagic fishes were also likely to have spawned in oiled habitats, including yellowfin tuna, blue marlin and swordfish. They measured the heart cells’ response to record how ions flowed into and out of the heart cells to identify the specific proteins in the excitation-contraction pathway that were affected by crude oil chemical components. Fabien Brette, a research associate in Block’s lab and lead author on the study said the scientists looked at the function of healthy heart cells in a laboratory dish and then used a microscope to measure how the cells responded when crude oil was introduced.